The Great King of the universe – the sovereign, powerful, glorious Creator of all things – chose to reside with His people (the Israelites) in His city. And because of God’s presence, the city is described as beautiful and “the joy of the whole earth” (Psalm 48:2). The citizen’s of God’s city not only enjoy His presence, but also His protection (v.3), love (v.9) and righteousness (v.10). This Great King is Lord . . and He alone is worthy of human praise. How have you experienced God as sovereign in your life? When was the last time God expressed His love to you? How have you seen God’s righteousness prevail in your life? When was the last time that you praised God specifically for His sovereignty? His love for you? His righteousness? Why not take the time now to praise God for who He is. . . for He alone is worthy of your praise! Jesus spoke the words above to the church of Ephesus. The church was doing a lot of good things. Jesus commended them for their hard work. . . their perseverance in their faith. . . their testing of those who claimed authority from God. . . their enduring of hardships for His name. . . and for not getting tired and giving up. But, the church had lost its first love – its first love for Him. Do you remember when you first “fell in love” with Jesus? If you can’t remember what it was like to fall in love with Jesus, do you remember what it felt like when you first were in love with your spouse? What was it like? Did you think of your love continually? Did you desire to spend all your time with your love? Getting to know Him better? Listening to what was on His heart? Was there a deep desire to please Him? Does that first love for Christ still exist in your life today? Do you awake each morning looking forward to the time you get to spend with Him? Or are you simply going through the motions? Are you passionate in your desire to please Him? Is your service for Him an extension of your love? Or is it merely a duty you feel needs to be done? Do you talk about Him with others? Does just the thought of Him bring a smile to your face and put a joy in your heart? Are you still deeply in love with Jesus? If not, remember what it was like in the beginning, repent (confess your lack of love) and return to Him! AW Tozer writes: “Worship is the effort to close the gap between the heart and the God it adores.” God wants us to worship Him, to acknowledge who He is. Worship shows our devotion to God. It’s an act of giving ourselves to God. When you spend time with God, try beginning your time by coming to Him in worship. . .praising Him for who He is! PRAISE GOD FOR HIS CHARACTER TRAITS. . . for His lovingkindness, His grace, His power, His mercy, etc. PRAISE GOD THROUGH HIS NAMES. . . try going through the alphabet. . . A: Abba, B: Bread of Life, C: Creator, etc. PRAISE GOD BY PRAYING BACK PRAYERS IN THE BIBLE – 1 Chronicles 16:7-10; 1 Chronicles 29:10-13; Daniel 2:19-23; Luke 1:57-69, etc. PRAISE GOD BY PRAYING PSALMS BACK TO GOD. . . Psalm 62, 89, 93, etc. Praise centers our attention on God. As we focus on God’s glory, we reflect on God’s greatness and receive it into our lives. We become more like God, when we focus our attention solely on Him (2 Corinthians 3:18). What are you reflecting to others? What would others say you’re reflecting to the world? Does your face reflect God’s glory? Why not focus your praise on Him and allow Him to transform you into His likeness with ever-increasing glory? How often do you meet with God? When was the last time that you had a heart to heart chat with God? Do you have a regular appointment with Him? or is it an occasional encounter? Are you receiving His guidance for living your life? or are you trying to do it on your own? 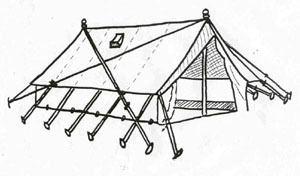 Where is your “tent of meeting”? that special place where you and God communicate. If your “tent” has been left without a visit for awhile, why not start a new habit today? Meet God and allow Him to “speak” to you as His friend! Over the years I’ve read the scientific accounts that if the Israelites crossed over at a shallow area. . . and if there was a moderate wind blowing . . . and if there was an abrupt change in the wind’s direction and it blew at just the right angle. . . and if the water level dropped 10 feet. . . then perhaps, there was a drying effect across the Red Sea from the wind. 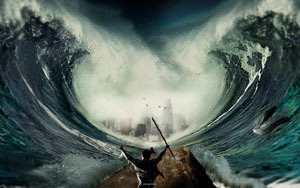 Miraculously though, God parted the Red Sea with monstrous walls of water piled up on either side of the fleeing Israelites. I can imagine giant fish displayed within the walls like they were in a fish bowl! Only God! Scientists may not believe it, but there was no doubt about the miracle for those who experienced it (Exodus 14:31). Where do you see God’s power displayed? in the birth of a child? through physical, emotional, spiritual healing? in a thunderstorm? on a mountain range? in a changed life? in a restored marriage? 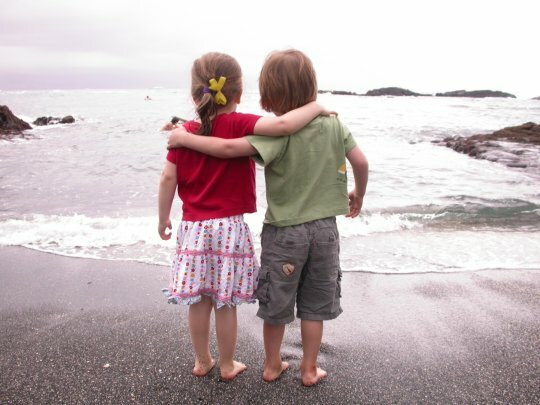 in a reconciled relationship? God wants us to know “His incomparably great power for us who believe” (Ephesians 1:19). 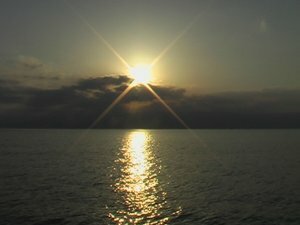 The power God wants us to know is greater than “Red Sea parting power”. . . it is power “like the working of his mighty strength, which he exerted in Christ when he raised him from the dead and seated him at his right hand in the heavenly realms” (Ephesians 1:19-20). And that power my friend is beyond what can be explained by science! Rejoice that you are a child of His! Nothing is impossible for God! My faith is increased when I remember that God has not changed! He is still kind and patient and personal with me. He is still sovereign and powerful with plans that prevail in my life. He is still holy and hates sin and yet, redeemed me. He is still faithful to His promises for me. He is still present and listening and active in my life and my world. How about you? When you take the time to reflect upon God, what do you see? And how is He increasing your faith today? Tomorrow in our “Read Through the Bible” program we begin reading the book of Exodus. As we read through the book, we will relive the story of Moses, the main character, and we will also see God laying the foundation for redemption, for His law, and worship. We’ll read about God’s nature – His attributes of justice, truthfulness, mercy, faithfulness, His sovereignty, and His holiness. The thread of God’s deliverance and salvation is woven throughout the book. And Exodus also teaches us how we should live. We learn from the successes and failures of Moses and others as we read about God’s ideals for Biblical ethics and morality. In tomorrow’s reading (Exodus 1-2), God’s promise of increasing the Israelite population became a reality (1:1-7). 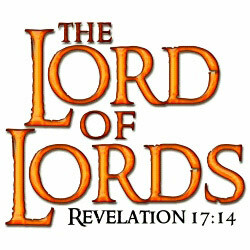 But, the Israelites were soon out of favor with a new king who came to power in Egypt (1:8). Worried with the threat of the people turning against him, the Pharaoh began to oppress the Israelites, worked them ruthlessly, made their lives bitter, even murdered their children (1:22). The chosen people of God were being persecuted. Are you being persecuted today? Is your life in danger? Are you being ridiculed for your faith? Ostracised for your commitment to God? Criticized for your beliefs? If so, don’t try to look for God’s purpose in the midst of your circumstances. Instead, ask God to help you see His perspective on your situation. Trust that God knows what He is doing and that He is working in and through you to accomplish His purposes! God was faithful to the Israelites. He did not rescue them immediately (they were in slavery for 430 years – Exodus 12:40). But, He did bring His purposes to pass. God will be faithful to you today. He may not “rescue” you immediately from you circumstances, but He will carry you through and work His purposes out in your life. The gospel of Mark begins with a prophesy from the Old Testament prophet Isaiah. Some 700+ years before Christ’s birth, the prophet Isaiah said that John the Baptist would be ordained to prepare the way for Christ’s coming. John’s job would be to challenge people to turn from their sinful ways and instead, look to God. He would bring the good news (the gospel) to the people of Jerusalem. 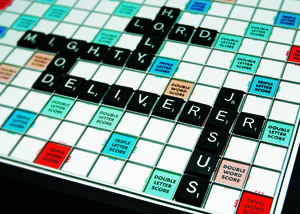 That good news could be summed us as: “Here is your God” (Isaiah 40:9). John the Baptist was to prepare a path out of the wilderness of a lost world and lead people to Jesus. Jesus commands all Christians to do the same. We are called to share the good news. 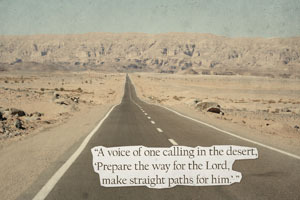 . . to be a voice in the desert preparing the way to the Lord. Today’s desert may not be the same as the desert John the Baptist preached in, but any life filled with sin is a wasteland. Who do you know that needs to know the way to the Lord? Who do you know that is struggling for a new direction, searching for meaning, for protection, for peace, and for truth? Can you remember how desperate things were for you before you knew the good news? . . .when you were stuck in the desert?